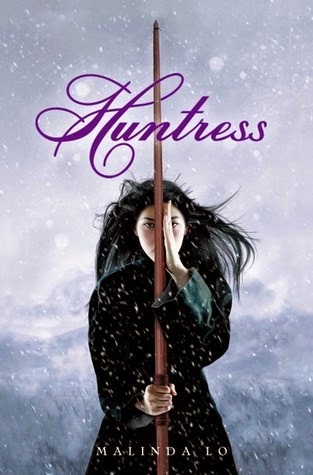 I've had a copy of Huntress by Malinda Lo on my TBR pile for such a long time. I can't think now why I waited so long before tackling this wonderful novel? Huntress is set in the same world as Ash but many centuries before it and is filled with great characters, an exciting adventure and a world filled with the detail and influences of Chinese traditions. I found it very easy to relate with these characters and with this interesting fantasy world. Huntress is the story of a band of travellers who are on a quest to visit the mythical Fairy Queen who might have answers to why the crops are failing, why the seasons have stopped changing and why strange things are happening and why dangerous creatures have started appearing in their lands. On this journey are Taisin, who is studying to become a Sage. She is inexperienced in dealing with the otherworldly but is also someone who holds great promise and skill who is able to see visions of what the future holds. With her is Kaede, the daughter of the King's chancellor and who is somebody who has no skill in becoming a sage but who is competent in other things. She goes on this journey in order to escape her father's expectations of her and the prospective marriage for political gain. With them is the Prince and three guards. I really loved the adventure that this band of people go through during the course of the novel. Things don't run very smoothly but it is the way in which these events shape the characters and how they react to them that made everything much more interesting. I really enjoyed reading the way in which Taisin was trying to gather more information and evidences about the weird occurrences on their trip and also the way in which Kaede began learning to protect herself and the others from the guards. Their goal of meeting the fey queen and solving the issues that have affected the world they live in was always the number one priority for Taisin, Kaede, and the others and the feelings that crop up between the two girls becomes and secondary story line. I liked that about this book. That this lovely, slowly built-up romance appears in the book but that character development and the main plot always continue as the main focus. Having said that, Kaede and Taisin's relationship is utterly sweet and I was really rooting for them throughout. A lot of barriers to their relationship are brought up initially - rules of becoming a Sage and also the pressures of making political alliances - but I really was hoping for the best for them both! Thank you, Aa'Ishah :) I was really pleasantly surprised by this book. Especially by the slow romance! Really glad you enjoyed this, Clover. It doesn't appeal to me though. After being disappointed by both Ash and Adaptation, I doubt I'll be reading anything by Lo again. But this is a great review! I hope you enjoy her future novels!